The Nodes of the Moon change signs today, initiating a new 18-month cycle in our collective evolutionary path — the major lessons we’re working through, what we need to let go of, and the energy we need to embrace to promote soul growth and successful forward movement. The North Node — the best way forward — shifts into Scorpio, urging us to face our inner darkness, uncover our deepest desires, and move toward what holds vitality and passion. 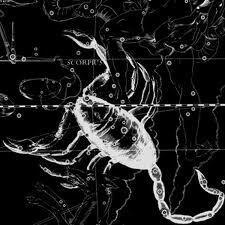 As the sign associated with the Underworld, deep feelings, death and rebirth, and mysterious forces beyond the ego’s control, Scorpio gets a bad rap in Western culture — which exalts the ego, encourages emotional repression, and has made death into something to be feared and denied rather than honored as a natural process and necessary precursor to rebirth.